I started to talk about this several years back and I believe it more than ever. Yesterday, we invited seven people to share why it matters to them that our church became a reconciling faith community a year ago. I can’t even describe the vibe in the room as person after person got up and shared with great honesty, courage and vulnerability. A father from a black and white background is loving his transgender son in ways that are changing them both. A high school student told a story of safety in a church until he realized he was gay and transgender. The support vanished. So did his connection with God. He finally feels safe enough to figure out who God is for him moving forward. A college student bravely invites her friends to church because she’s proud of the kind of Christians who are there. A retired pastor told a story of his journey with a best friend and how that’s inspired him to advocate for justice for all. A lesbian couple shared through some tears of how deeply it has changed them to be accepted and welcomed in this place. 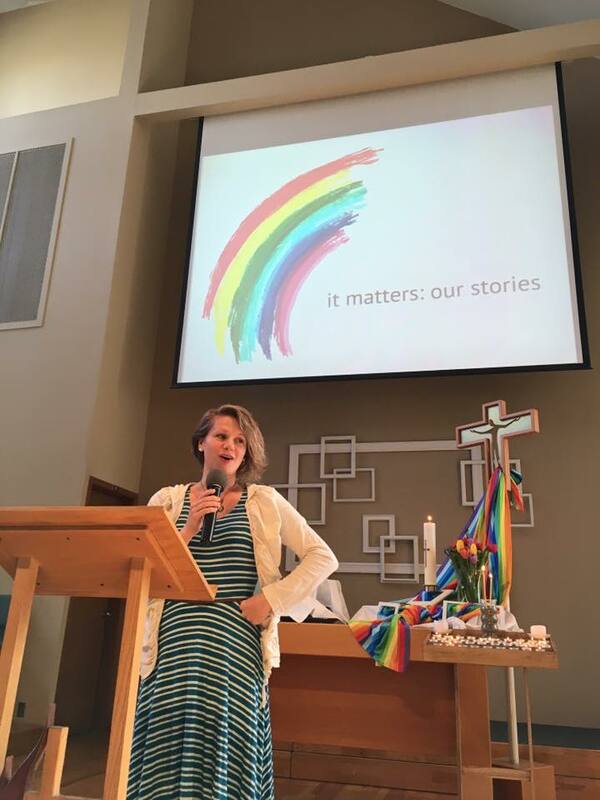 A young woman told the story of seeing the rainbow flag on our sign out front and realizing, maybe, just maybe, if they would accept LGBTQ persons, maybe we would accept the things going on in her story. Someone recently asked me the basic process I go through to invite people to share in worship. I’m always listening and looking for people and stories who show honesty and some kind of change. It doesn’t take long before I see and hear God up to something in their life. Here’s the hardest part for me: Do I wait until the journey they’re on is past them and they can share in a healthy way about it? Or do I invite them to share while they’re in the middle of something? I’ve made mistakes both ways so I’m still learning. I’ve heard best practices point both directions. So for now, I lean on my gut feeling as to whether they’re ready or not. I also remind myself we’re never finished with our growth – we’re always learning and changing – and if I waited until we were all done, we’d never have stories to share. God meets us wherever we are on the journey. I give people a simple prompt, a suggested length and a couple weeks notice. They come up with a draft and send it my way. Nine times out of ten, it’s great just as it is and we go over final details on the day they’ll share. Our stories really matter. This is how people get a glimpse into what God is doing in the world. You can read or watch some of these stories here. God is good!